But her yams did melt in your mouth with lots of favor and look and smell so good. 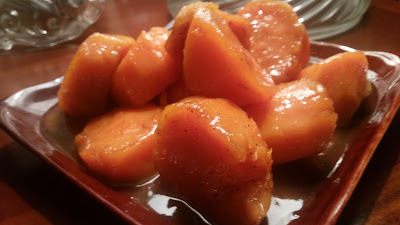 You can tell a good candied yam dish just by looking at it....the color have a lot to do with it that bright orange and yellow color with that gloss of shine and that syrup of goodness. What made the yams bright is the lemon juice and give it that clean and light taste. I remember some one bought some candied yams to a church dinner and I just could believe how dark the dish of yams was. Nobody did not eat those yams and I felt sorry for that sister or brother bring those to the church event. Ohhhhhh I know what they did, they used the yams in the can and try to fix them up. please please don't ever uses sweet potatoes in a can to make candied yams. Directions Peel the sweet potatoes and cut them into 3 inch slices add water and all ingredients into a pot with a top. 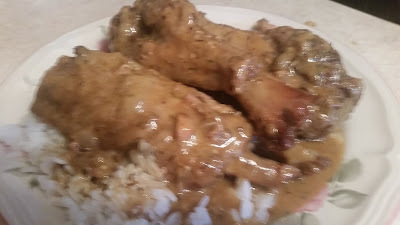 Cover and cook 40 mins or 1 hour until liquid has thicken.